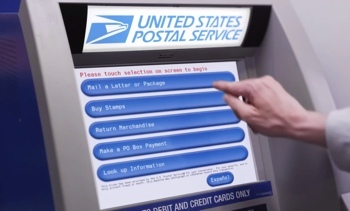 The United States Postal Inspection Service is urging Americans who use self-service stamp kiosks to be on the lookout for attached credit card skimmers, following a rash of fraud linked to Post Offices in 13 states and Washington D.C.
As reported by Krebs on Security, the fraudulent activity dates back as early as November 2013. Thieves are using the stolen information to clone cards and attempt large cash withdrawals at ATMs. It’s not known how debit card PINs were stolen in these incidents, though in similar crimes, scammers have attached a tiny, inconspicuous camera aimed at the keypad. Skimmers can often be difficult to spot, if you’re not looking for them. So be on alert when paying for your stamps and shield your hand while entering your PIN. Also, keep an eye out when using your card at ATMs and gas station pumps – both are popular targets for card skimmers, as well. If you’ve used a Post Office APC in Arizona, California, Colorado, Florida, Georgia, Kentucky, Massachusetts, Nebraska, New York, Oregon, Pennsylvania, Utah, Viriginia or Washington D.C. since November 2013, you’ll want to keep an eye on your credit card statements for suspicious activity (if you aren't already). You might also want to look into a free credit monitoring service like Credit Sesame.